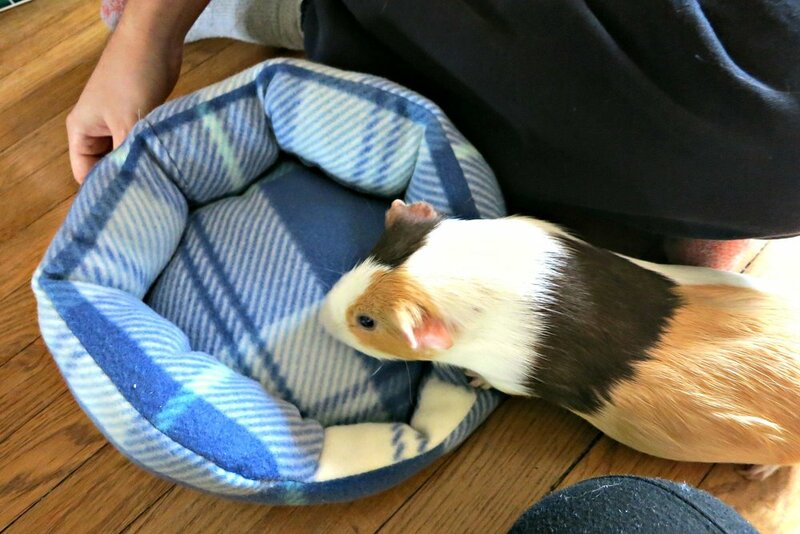 Here is our video tutorial on how to sew a simple guinea pig cuddle cup bed with fleece, polyester pillow insert, and a straight stitch on your sewing machine. It only takes about 2 hours from drafting your own pattern to finish sewing. Fleece fabric is very warm and does not fray like most woven fabric, so it is perfect for pet sewing. It also keeps the surface dry and easy to wash. Hope you enjoy the video and don't forget to share and subscribe. The process is very simple, draw your own pattern according to the size you like. My 10" wide oval shape seems to get a little tight for my almost 1-year-old guinea pig. 12" might be a better size to try for a grown-up guinea pig. The top, long piece is 4 inches high and 2 inches in the front as an entrance. Sew the top and bottom pieces separately and then sew both pieces together. Stuff the polyester filling as you go, and finally sew together both top and bottom pieces. The seam will be hidden because of the puffiness of the bed. If you make a bigger version, it will be good for a cat or even dog. Happy sewing! A sewing tutorial (video tutorial) on making a simple fleece dog coat with bias tape edge. Simple pattern and straightforward sewing. How to sew a guinea pig cuddle cup. The cuddle cup is a C-shape pet bed with a higher wall in the back and lower wall in the front as an entrance. You need a fleece fabric and polyester or cotton filling, and a sewing machine. Video tutorial. It is not hard to turn a sweater or jumper into an open front cardigan. I use store bought "double folded bias tape" and "separating zipper". It just takes some courage and know-how to cut open your first sweater. It is hard to find a perfect house for your little pet. Sewing a pet bed is not hard, and your guinea pigs or little pets will appreciate the customization and comfort of a good quality bed. A simple tutorial of making a fleece cage liner or pee pad for your guinea pigs, hamsters, rabbit or other little pets. It is an eco-friendly alternative than buying the disposable bedding from pet store.